Not all instructors are at all retreats. Email holly@surfwithamigas.com to find out which instructors will be attending your retreat. Holly Beck grew up the oldest of five girls in Palos Verdes, CA. She always loved the water and wanted to learn to surf around age 12 but her very old-fashioned mother would not allow it, telling her, “surfing is for boys, you’ll never get a boyfriend out there competing with them. You should be sitting on the beach looking cute in a bikini!” By age 15 Holly had saved up babysitting money, bought herself a surfboard and a wetsuit and never looked back. In June of 2001, Holly graduated from UCSD with a degree in Psychology and won the amateur National Surfing Championships. She turned pro and spent the next 10 years traveling all over the world to places like Australia, New Zealand, Brazil, Peru, South Africa, Gabon, Sao Tome, the Seychelles, the Andaman Islands, Hawaii, Tahiti, Fiji, England, France, Portugal, Ecuador, the Galapagos, Mexico, and Costa Rica. 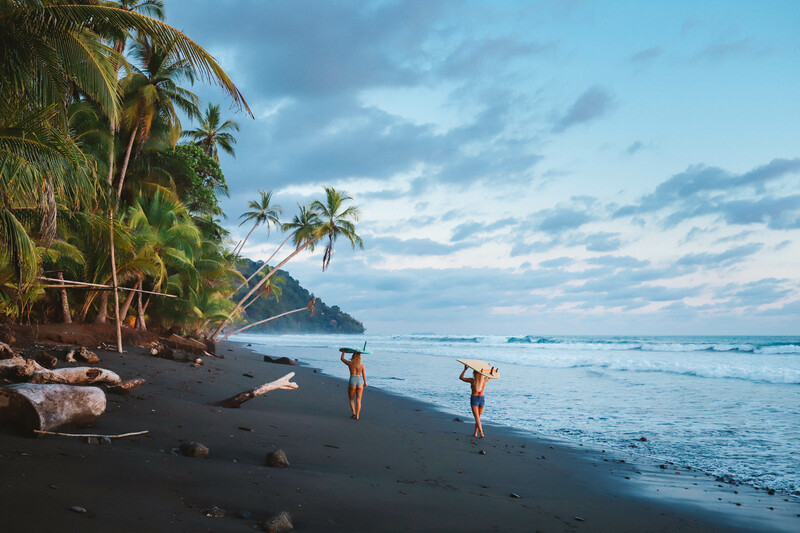 On a trip to Nicaragua in 2006 she fell in love with the warm water waves, friendly locals, and laid-back lifestyle, bought land, and began to fantasize about moving to Central America full time. While still traveling as a pro, Holly earned an MBA in Marketing and crafted a business plan to start a women’s surf school in Nicaragua. In 2010, she founded Suave Dulce, later changing the name to Surf With Amigas. She believes that anything is possible if you are willing to work hard and visualize success. As further proof of this philosophy, Holly now splits her time between Nicaragua and Costa Rica with her awesome husband Kim, and two young kids Luna and Soleo. Jackie George grew up spending the majority of her time on the beaches of her southern California hometown, San Clemente, where she developed her expertise as a water woman and beach bum. In high school, she embraced the path set before her by previous generations of lifeguards, swimmers, surfers, and water polo players and devoted her time and energy to exactly those things. Jackie went to on to study cultural geography and Spanish at Humboldt State University where she was able to explore California’s more remote coastline, the home of bigger waves and colder water. It was in Humboldt that she developed a love for a natural and slow-paced lifestyle, but eventually tired of the cold weather, and decided to head south to Nicaragua for the winter. That first winter working with Holly quickly turned into eight months, which quickly turned into a business partnership and friendship that is going on six years. Before coming to Nicaragua, Jackie worked as a surf instructor up and down the coast of California, a beach lifeguard, a swim instructor and coach, and a whitewater rafting guide, and spent any free time she had traveling the world in search of adventure. Working with Surf With Amigas seems to be a culmination of her university studies, guiding and ocean experience, and inherent love of travel coming together to provide her dream lifestyle. In her time off from retreats you can find her searching for surf somewhere in Central America, hanging with her boyfriend on her little farm in northern Nicaragua, or cruising up and down California’s highway 1 in her camper truck. Carly Chivers is one of the rare instructors that excels at both surfing and yoga. She is both a surf and yoga instructor. The path of self inquiry through yoga practice is an ongoing exploration for Carly. She attended Brandon University in Canada, studying psychology and world religion, and competing in volleyball at the CIS level. During this time, the practice of yoga came about as a way to balance out her life, and her physical body from the constant impact of sport. Since then, yoga has evolved into a constant source of deep grounding and inspiration in her life. Yoga, combined with a dedicated passion for surfing, has led her all over the world. She has surfed and explored Europe, N. Africa, Indonesia, Hawaii and is currently living in Central America. Her love for the ocean and surfing has a strong influence on her yoga practice. Carly often marvels at the parallels and level of meditation that both surfing and yoga offer, both allowing for moments of deep connection to nature and to self. The ebbs and flows of moving through life and the constant flux of the ocean are great teachers for Carly, always reminder her to let go, enjoy the ride and find an immense of level of gratitude in every moment. After years of practice, Carly took the leap to become a 200 HR RYT in 2011. Since then Carly has been studying, and sharing her contagious love for yoga, and the peace she finds on the mat with her students. Carly challenges her students to express their most authentic self on the mat, and in the world. Teaching, sharing her passion with others, and encouraging her students to pursue what inspires them, is what keeps Carly going! Cherise Richards grew up in Ashland, Oregon and spent almost twenty years in the modern dance world as a performer, teacher and choreographer. She has a BFA in Dance from UCSB and an MFA in Choreography from California Institute of the Arts. She has also been a member of the Capoeira community for 20 years and has taught Dance and Capoeira at Loyola Marymount University, CalArts, UCSB and ACDFA among others. She had her sights set on a dance teaching career at the college level, but found her time and attention being dominated more and more by her growing love of surfing and the beach lifestyle. The shift from dancer to surf instructor/full time beach dweller was made official when she packed her belongings into a storage unit and started working for Surf with Amigas in Nicaragua. Paul and Suzee Grilley have been her Yin yoga mentors for 15 years and she has been teaching yoga for over 5 years. Throughout this time Yin has been an antidote to her more muscularly dominated activities as well as an anchor into a sense of spirituality through chakra meditation. She is the featured model for the book “A complete Guide to Yin Yoga” by Bernie Clark as well as featured in several of Paul Grilley’s DVD’s. As a teacher she particularly enjoys tailoring yoga classes to the special needs of surfers and finds Yin lends itself particularly well to this aim. Teaching yoga for surf with Amigas has been incredibly rewarding for Cherise as she loves being involved in both the adrenaline inducing surf aspect of peoples’ SWA experience as well as their unwinding, regenerative yoga experience. She is also talented on the computer. With a great eye and knowledge of body mechanics she is one of our video coaches. She also edits many of the weekly highlight videos. Michelle Kienlen was born in Black River Falls, Wisconsin and moved to St Petersburg, Florida at the age of 6. Growing up fishing, playing softball and a few musical instruments she was not introduced to surfing until the age of 15. That first wave was all it took and she was hooked. Surfing instantly turned into a passion. Her parents were unsupportive but as soon as Michelle was 16 she drove across the state every weekend to surf the Atlantic side of Florida and learned to surf. She picked up a few small sponsors including Nekton surf shop, NXTC shapes, Zinka, and DNA energy drinks. With the support of Tommy Daniels shaping her boards and coaching, Michelle started avidly competing, surfing small waves in ESA and local pro-am contests all around Florida. After that, she decided to start traveling in search of better waves in between school and work. At the age of 19 a close friend brought her and her friend Nina to Puerto Rico. They loved the perfect Caribbean waves and took many trips back to PR to surf. Since then Michelle has traveled to Nicaragua, Costa Rica, Hawaii, and El Salvador. She is currently taking classes online and working at the Don Cesar Hotel on St. Pete Beach, Florida, when not surfing with and inspiring Amigas. Alejandra (Alex) was born in Cádiz, the very south tip of Spain, where the mediterranean sea meets the Atlantic Ocean. At age five she moved to California near from San Fracisco. She still remembers sipping hot chocolates while watching the sunsets in Half Moon Bay. When she turned 8 the family moved to a tropical surfing town called Melbourne Beach, FL where she met local surfers and friends of her mother that got her into surfing. But, quickly after getting hooked on the ocean her mother moved back to Cádiz. Alex’s father is a sailor and pilot, so thanks to him she was able to sail and travel throughout exotic countries. The ocean became her passion and she went on to study Oceanography. While studying her degree she started a local surf school where she worked as a surf instructor also incorporating yoga in her surfing classes. For five years she lived in a caravan with her two dogs, working, surfing, studying and traveling in her four-wheeled home to the nearby coasts of Portugal and Canary Islands. Recently she decided she needed a change. So she thought warm water, consistent waves, nature paradise…Costa Rica sounded like the best bet. After having her best friend pick her up at the airport she started her adventure throughout Costa Rica where she felt full of energy, beauty, and alive again. This became her own overwhelming desire to embrace pleasure and enjoy!! The beginning of a new journey to become a better person and surfer. While surfing in Pavones, Holly saw her ripping and smiling and paddled up to her to ask if she might want to work with Surf With Amigas. Aura Boulton, 33, was born and raised in Caracas, Venezuela. She spent many of her early years on a cattle ranch and began to be a lover of nature and horses from the age of 3. She also spent a lot of time on the beaches in Venezuela where her love for surfing was initially sparked by her stepfather at the young age of 8. She lived in NYC from the age of 12 to 21, left surfing and farm life behind, finished high school, and studied photography and sociology. But missing nature and her Latin culture too, Aura then moved to Costa Rica where she worked as a photographer, got certified as a Naturalist guide, and attended a year of Agriculture school. In 2004, Aura returned to her native country, Venezuela, started surfing again, and together with some friends founded a NGO that facilitated environmental and sports education programs for poor kids and communities along the coasts. At this time she also began traveling some months out of the year to Panama, Puerto Rico, Hawaii, and Indonesia. She began designing clothes and took up surfing as a serious hobbie. Her love for surfing grew, and Aura was lucky enough to end up living on the North Shore of Oahu for 3 years where she studied massage and collaborated with several cultural and environmental organizations. Now she lives in Nicaragua, continues to do work with local communities, practices yoga, massage, surfing, and is making her dream come true of owning a beautiful piece of land where she intends to run an off the grid eco-walk and home stay. She believes in community unity, education, health, and sharing the love of the land and sea with all. Coco grew up in the Caribbean on the island of St. John in the US Virgin Islands.. It was there that her and her two sister’s started surfing together. Unfortunately the waves weren’t very consistent so their new focus was to travel.Coco has surfed all over the world, catching waves in Australia, California, Costa Rica, Hawaii, Mexico, New York, Nicaragua Panama, Puerto Rico, and the British Virgin Islands.She has been surfing for more than 15 years, and in 2009 she earned a diploma in Sports Management & Surfing Studies from Southern Cross University in Queensland, Australia. In 2015, she was inspired to turn her love of the sport into her full-time career so that she could share her passion with others. She has taught professional surf instruction in Australia, Costa Rica, New York and the Virgin Islands. Coco also developed an interest in Yoga after she used yoga therapy as a way to heal from an injury. She later went on to study Yoga at the Dyhana Ayurvedic Center in California. She got her 200 RTY in 2014, and now teaches restorative Yoga, focusing on practices and poses specifically for surfers. Coco loves sunsets, coconuts, running on the beach, being barefoot and hunting for perfect waves and empty line ups. She currently resides in Playa Grande, Costa Rica with her twin flame of 10 years. Delia Kang is a surfer, ballerina, and environmental advocate. She grew up on the Northern California coast where the water is cold and the waves are often big and stormy. Luckily, her father made learning in these conditions fun, and she was completely hooked by age eight. Now, Delia loves the thrill of surfing big waves, and the sense of being in-tune with yourself and the ocean it brings. Delia’s passion for surfing lead her to pursue a career focused on protecting the ocean. She attended UC Santa Cruz where she studied environmental science, and competed on the UCSC surf team. She finished her education at Humboldt State University, receiving a Bachelors of Science in Environmental Management and Protection. For the past two years Delia has been the Chair of the Surfrider Foundation Humboldt Chapter, a nonprofit dedicated to the protection and enjoyment of the ocean waves and beaches. If Delia is not in the office or in the water, you can find her on the dance floor. Having studied ballet her whole life, she feels it has given her surfing more balance and elegance (she also enjoys spontaneous dance parties). Recently, Delia has felt ready to trade in the wetsuit and booties for a bikini, warm water, and new adventures. She is excited to share the stoke of surfing and love for the ocean with the Amigas! Chloe Piester grew up in Saint Augustine, Florida and started surfing around age 7. For her, the ocean has always been home. As a child she spent countless weekends at the beach with her family surfing and playing in the ocean and she feels abundantly grateful for her mom who always kept the ocean a constant factor in her and her family’s lives. At age 13 Chloe landed her first gig as a surf instructor at an all girls summer surf camp and she has been a surf instructor at various surf schools every summer since. Now, at age 21, Chloe resides in Encinitas, California, where she is a full time student and part time nanny and surf instructor. She hopes to spend as much time learning and growing inside the classroom as she does outside of it, so she travels as much as she can to surf and explore in between semesters. Her latest travels include the Bahamas, Costa Rica, Nicaragua, and Indonesia. Outside of school, work, and travel, you can usually find Chloe hanging out at the beach, either with a book in hand or surfing. Although she does not teach yoga, she became an RYT certified yoga teacher in 2015 and claims it was the richest experience she could have been given as an 18/19 year old in her first year of college. Chloe plans to get her bachelors degree in global business management and she hopes that this will enable her start her own business where she can continue embracing new cultures, traveling, surfing, learning, and being stoked on life! Hannah Millner grew up romping around the rivers and mountains of Southern Oregon. Surrounded by rural, natural beauty her entire life, she has always had a passion for adventure and the outdoors. In 2011, Hannah moved to far Northern California to pursue her education, expand her relationship with the ocean, and explore the world of sustainable agriculture. She taught herself to surf while attending college, oftentimes paddling out before class. The abundance of large swell and cold, rugged water encouraged her to face her fears and to persevere amidst challenging conditions. Outside of the water, she has been working as a small-scale organic farmer, hoping to supply local, healthy food to her community and working to reduce the global carbon footprint. She also enjoys working with metal and designing jewelry for her business, Sea to Seed. When she isn’t stuffing herself into her neoprene superwoman suit, you can find Hannah surf-camping in her truck, picking blackberries, or trying to sing in Spanish. Hi y’all, I’m Katie Wiebke and I hail from the Carolinas. An ocean lover since birth, I have always been drawn to the water. Growing up inland in the city of Charlotte, however, meant that I had to join the swim team at the local pool to stay in the water. That led me to competitive swimming through high school. Eventually, though, I realized that there were way more interesting things to see in the world than the black tiles lining the bottom of the pool, so I voyaged to the sea! I was first introduced to surfing in Charleston, South Carolina, and it was an innate love revelation. Now in full suite of my new found passion, I made moves to Nicaragua, searching for bigger waves and warmer weather. I started out volunteering as a cook at a local surf camp in Playa Gigante and later moved to Playa Colorado, where I live now. I learned to surf here in the powerful waves of Nicaragua. I like to think that the faster the wave, the faster you learn!! And, boy, am I blessed beyond belief. When I am not surfing the super consistent world class waves at Playa Colorado, I teach English in the local elementary school, Escuela Santa Marta. I absolutely love Nicaragua and the ocean! Jana Virian grew up in the forests of Germany, as far away from waves and coast as can be and was introduced to surfing in 2011 whilst exploring the southern hemisphere. Always drawn to the water and the joy of expressing herself through movement competing in swimming and dancing from a young age she instantly fell in love with everything surfing has to offer; the physical and mental challenge, the incredible joy and thrive it brings, the need to be present, the chance to explore and connect to the most beautiful and various types of nature, and all of this enjoyed together with like-minded people. After surfing the coasts of New Zealand, Australia, and Indonesia she decided to move closer to home and expand her mind on psychology and physiology by studying Sport Science in the UK where the waves are stormy and cold and the nature raw but cups of teas keep you warm. During her studies Jana had the chance to travel in her van and surf along the European coastline whilst working as a surfinstructor. Drawn to nature Jana moved into a caravan in the beautiful Conway valley where she did a Master of Research in Sport Psychology funded by and in cooperation with Surf Snowdonia, an artificial wavegarden based in Snowdonia Nationalpark, North Wales. This gave her the chance to not only research the most effective instructions and its neurological underpinnings facilitating learning for both beginner and advanced surfers but also to train on a consistent wave every day. After finishing her Masters in early 2017 and being landlocked Jana travelled to Central America to chase warmer, more epic, and real waves to reconnect with the ocean and her heart. She started working with SWA and loves empowering other adventurous women and passing on the passion of surfing and living a mindful, healthy, and conscious life. She fell in love with Nicaragua and the people there who are giving back to mother nature where she’s living on an off-the-grid permaculture farm. Inspired by the healing powers of surfing and mindfulness Jana wants to further research the importance of meditation and connecting body and mind in BC, Canada, in order to help others heal themselves, create a second home and find a balance between living the cold and warm water dream.